They are going to have a hard time topping Blake's Hobbit creations I think. Pretty interesting news, there is good and bad to it: new sets/characters/elements, but at a higher price. Between this and the Super Heroes license, I'm going to be really broke this year. This is only good news if it doesn't end up replacing Kingdoms and future Castle sets. I fear it could replace Kingdoms But who know, we might get a few more kingdoms sets, but I cannot see new fractions and lots of new sets. Very exciting news! My only complaint is that they will be fleshies.... Not that I have a grudge or anything! The sets are bound to have a lot of great new stuff for castle...armour, helms, weapons, orcs, goblins, hobbits... Of course there will be Gollum! nanuck95 wrote: They are going to have a hard time topping Blake's Hobbit creations I think. bentoft wrote: I fear it could replace Kingdoms But who know, we might get a few more kingdoms sets, but I cannot see new fractions and lots of new sets. That it is likely to replace Kingdoms is probably inevitable, and there's not a whole lot of point complaining about it. Kingdoms was coming to the end of a normal 3-year run anyway, and it's not as if we were promised an awesome new follow-up line that has now been cancelled. And once the LotR/Hobbit wave has passed, we'll probably get a new Castle theme again. In the meantime, we've got a shot at a lot of new, Castle-friendly moulds, just like the broader Pirates theme has a lot more variety post-PotC. That said... I hope we get sets with the kind of strong set design that we see with the best of the Star Wars sets or with most Indiana Jones sets, rather than the kind of lacklustre (at least imo) PotC sets. 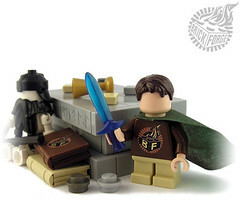 If we are going to endure a fleshie-fig, extra-priced interruption in the Castle continuum, it would go a long way to appeasing Castle fans accustomed to the standards of Fantasy and Kingdoms to have some well-designed sets. And, for what it's worth, those fans clamouring for a change from "walls and siege engines" should cross their fingers--this is the chance they've been waiting for. Wow. I'm kind of split on this. For years I've been saying that we don't need a LotR license, and I stick by that. That said, anything that prompts them to make new figs, new molds, and to increase interest in Castle in general, is, of course, a good thing. I, for one, couldn't give a toss about kingdoms being given the shove if it means lord of the rings - I mean, people, come on, it's Lord of the Freaking Rings! I, too, think it is pretty much a given that LOTR will replace Kingdoms. I'm fine with that. As has been said, Kingdoms was probably nearing its end anyway. Like Bruce, I have never thought that we needed LOTR sets or that they would ever happen. In fact, I'm sure I'm on record as saying that somewhere on the forums. However, now that I have been proven wrong, I'm rather excited to see how they turn out. The main problem is that they will be fleshies, but I will survive. I'm sure there will tons of new parts for us. I've been a LOTR fan since I learned to read...I've been a LEGO fan for longer than that...a marriage of the two is cool. I'm not sure I like this. One more line in which we cannot get yellow figures. And the many licensed scharacters and accessories lately have been so detailed and specific to the characters, they're rather hard to integrate with non-licensed figures. I for one am very excited to see the new lord of the rings line. I enjoy both so much that I cant imagine how the two coming together could ever be a disappointment. Im so ready to see some pictures of the new figs/weapons/accessories/castle building elements!! I think I'm with Josh and Bruce on this - while I'm sure I'll be buying as much of these as I can afford, my feeling is more one of "well, I suppose it was inevitable," rather than "wheee!". I'm not sure why, really - I have no particular hate for fleshy figs, nor licenses in general - something about this one, though, bugs me for reasons I can't quite articulate. And that's speaking as someone who loves both the films and the books. 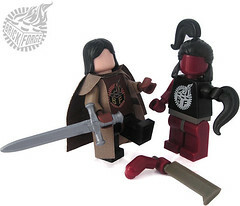 Also, an Impossible Set Idea: A double-sized battle pack of the entire Fellowship in one go. The reasons for TLC not doing this are legion, but it would be O so cool.